Reviving Ainebel Hospital project with the guidance of UNDP- Live Lebanon. During the LDE, the British Columbia delegations met with Mr Rawad Rizk (a project manager of UNDP) at the desk of LIVE Lebanon, and learned a lot about this UNDP initiative in partnership with the ministry of foreign affairs to reach out to the immense Lebanese diaspora worldwide and gives them the opportunity to support the people in their homeland that are in need with important community based initiatives. The WLCU-BC council delegation decided to relaunch the Ain Ebel hospital project,and to cooperate with Live Lebanon. Mr John Badr pinned the red pin in the map of Lebanon at the Ain Ebel to announce that the Ain ebel hospital project is under consideration. 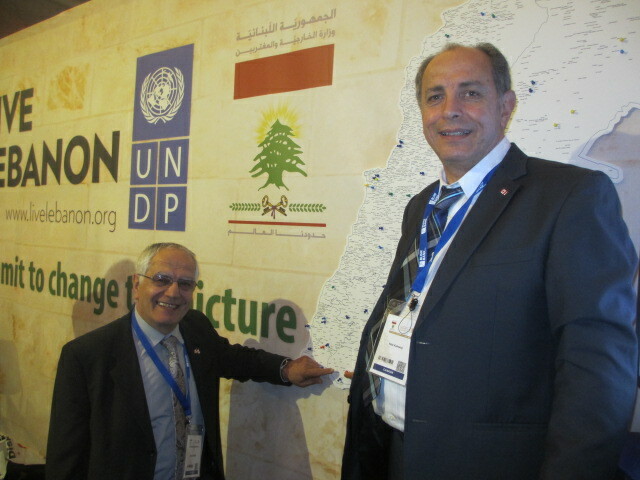 We would like to thanks Mr Rawad Rizk and the team of UNDP-Live lebanon for their support. Previous article The 2nd Emigrants Economic Conference (EEC 2016) on the 14th of July 2016 at Movenpick Hotel in Beirut. Next article Norman Nahas, President of the Lebanese chamber of commerce in Halifax.